The Found Change Challenge Total For 2014 Was . . .
And the grand total was . . . $35.90 in change! Add to that the two one dollars bills and I found $37.90 in 2014! This doesn’t even count the foreign coins, coins too messed up for the coin machine to accept and the single very real looking plastic penny. So what did I do with the money? I put it into the kids’ college fund and then washed my hands. Because coins are dirty, dirty, dirty. Especially the ones found on the ground. Did you participate in the Found Change Challenge? Please share your totals in the comments section below. And just because it’s January 8th doesn’t mean you can’t jump in for 2015! I will be cashing in my large jar this week. I used to have a few large jars that I used for change, but cashed them in and then gave away the jars because I didn’t want to have to move them. I usually use the money for a vacation and since I’m going to NY next week, I will use it then. Then I’ll start saving for our 2016 trip. And I put all change in the jar and have a small jar for found change. Unfortunately for the purposes of this post, I don’t tally found coins/bills separately from the NY State deposit soda/beer/water containers I pick up on my daily walks. (To me, it’s all found money.) But my 2014 total for change and containers was $348.80. Cha-ching! Wow, that is super impressive!!!!! I miss bottle/can refunds! I grew up in Massachusetts, but they don’t do it in Washington. Sad. That stinks! I dislike paying the extra 5 cents at purchase but the fiance wouldn’t get to drink soda if we tossed the cans. 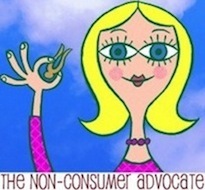 It is our comprimise. Don’t be too broken up about not being here anymore, yesturday (1/8) it was -2 with a -24 windchill when I went to start my car (Milford, MA) and today it is snowing! I also have to say that every time that I have seen you comment here I kept thinking that you have a familiar face. So it is a bit WOW to hear you grew up out this way! Living in the car driving suburbs I find very little money. But the other day I was leaving a restaurant with a friend when I bent down and picked up what looked like a badly scarred penny, although it seemed very light. I showed it to my friend to ask her if she thought it was real and before I could stop her she threw it into the trash. The plastic penny made me laugh. I found a 100 dollar bill all folded up outside a blood collection clinic this past summer. I spent 45 minutes trying to find a security guard or see if anyone would say if they had dropped anything (near a bus stop and a mental health clinic, so lots of seniors and others on very fixed incomes in the area)… the way it was folded I was picturing a senior walking with it in the palm of their hand. Anyway, after tons of stress and cursing myself for not just leaving it there (in case they had come back looking for it while I was looking for security) I hauled it out and realized it was VERY REALISTIC play money. That was a less pleasant found money experience. Nice haul, I definitely pick up coins… and ‘free coffee’ stickers off of abandoned cups, LOL. I found a very realistic $500 bill in a library book. I was using it as a bookmark, but carelessly left it and my book sitting in a chair at the doctor’s office while I answered a few questions at the check-in, and book and bookmark vanished. No one in the area saw a thing….. 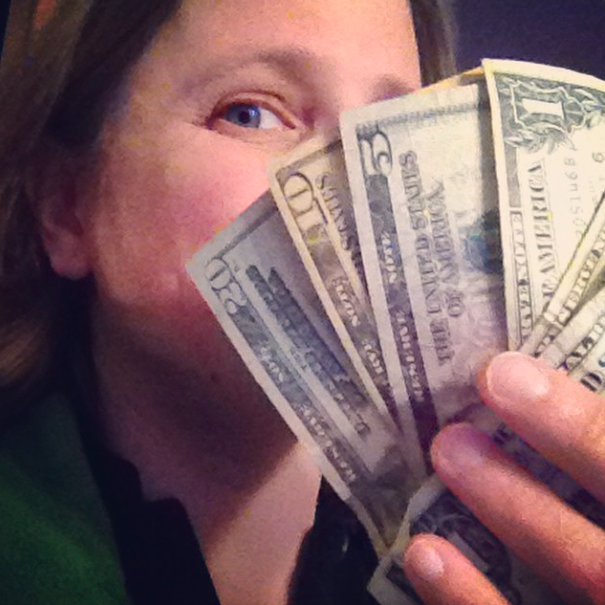 This wasn’t my best year – only $4.88 in my found money jar. It went directly to our local food bank. Next year I’m going to add in the nickels from found returnable cans. Happy New Year! I was walking the dog in the summer and found a $20 bill on the grass then about two steps later there was $1 on the ground. I’m sure it fell from someone’s pocket – Starbucks is a few blocks away. I looked around and no one to be seen. I used it to buy lunch for us as we were moving our daughter that day. Hey! I see a Canadian penny in the pile, we don’t have them anymore so save it, it will be a collectors item one day. 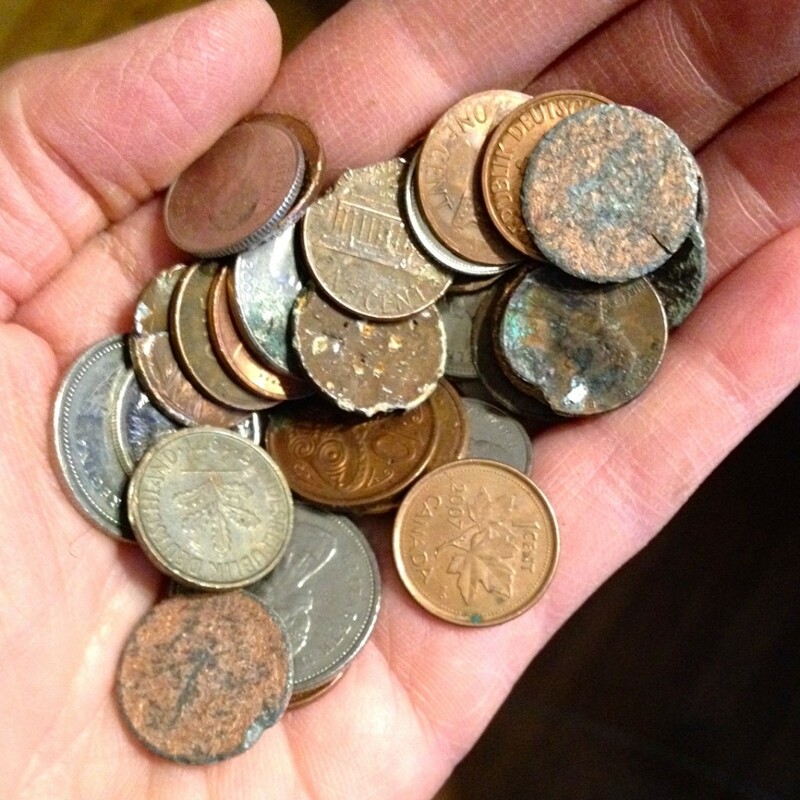 Unfortunately, since the penny went we don’t seem to have as much change lying around anymore. My husband did bring home a $20 he found.It went in my emergency money stash. Where I am in Upstate NY (only 90 miles from the Canadian border), most stores will take Canadian change at U.S. face value as long as it’s only the odd coin here and there. Also, I attended a literary conference in Montreal this past October and took along a big wad of Canadian change. Big laugh at the bar as I counted most of it out to pay for a beer! I’ve been collecting Canadian Coins for quite a while. I must have 10 or so pennies! And you found a lucky German penny! I don’t have a found money sum to report but, when I was counting out change for my daughter’s lunch money yesterday I discovered a lovely 1942 Mercury dime. The silver alone is worth $2.00, but I plan to keep it! I collect found money plus some of the change from my pocket (whenever I seem to have a lot of coins which can drive me crazy). I take out the quarters, which I keep in my car for parking meters (no parking tickets for me!). 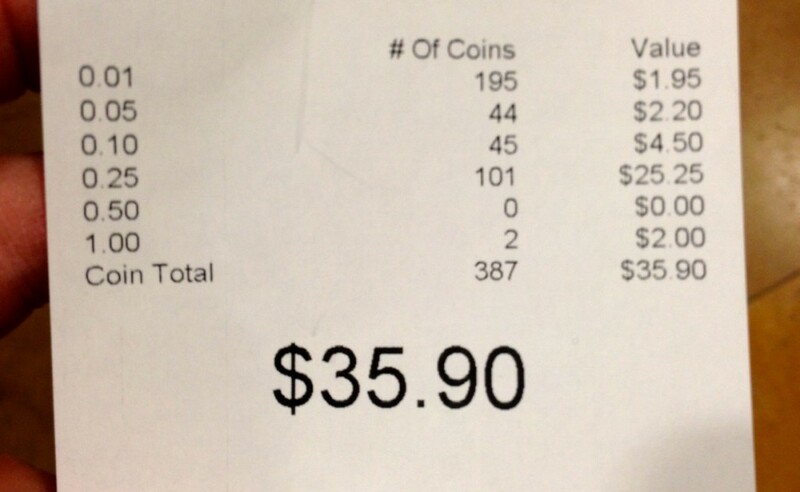 I used coinstar to count the change and donate it to charity — $29.75 this time. I just happened to do it last week, as part of a large cleanup I was doing, it’s not a yearly thing. I don’t collect found money because I hope those less fortunate will stumble upon it instead. I work in a large city and the homeless population is shocking and so sad. I love that some of the readers here give their found treasure to charity. $38 could make an enormous difference in someone’s life. It could mean food for a month. You blew my $13.48 way out of the water. I’ve been donating my found money to charity for years. I wish there was a return on aluminum cans here. This week I walked through my neighborhood park and gathered a huge plastic bag of beer cans. Must have been some party. I found 28 cents yesterday in the change cup at the grocery store self checkout when I ran in to buy bread. Tonight I found 2 cents also at the self checkout when I had to get fruit bars for my son’s sore throat. Two different grocery stores. We don’t have bottle or can deposits here in Maryland but I take our cans to a recycling center where they pay 50 cents a pound. On Tuesday and Wednesday they pay an extra 3 cents per pound if you are 55 or older. I got $9.01 last week when I took in our cans. On a related note, I am helping an elderly friend of mine dig out from under a mountain (literally thousands of envelopes) of charity solicitations. Charities put small amounts of money in their asks to get you to open them so she won’t throw anything away unopened and can’t keep up with the volume. So far, we have unearthed over $60! Finally, on the occasion when I lose money, I now think of how it will make the finder’s day. In my poorer days, a loss of $15 would have been devastating. Now I can live without it and imagine how happy someone else will be. I think I only found about $0.15 on the ground this past year but a penny found is a penny earned. 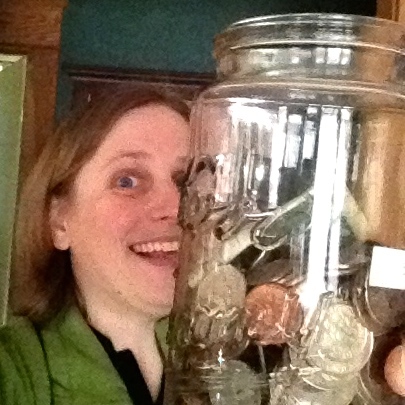 I’ve been collecting pennies, dimes and nickels in jars for a couple of years (mostly change from my husband’s pockets and the dryer after the teens do their laundry) and just took my jars to CoinStar on Wednesday this week. I selected the e-gift card option to avoid any fees and got a Lowe’s gift card for $56.54. I will be using it to buy gardening supplies for my Spring vegetable garden. I also keep the quarters since I have 2 sons in college who might need quarters for their laundry from time to time. My ten year old son and I did the found change challenge. We live in the eastside suburbs, so most of what we found was in the grocery store. He would look around for change on the floor while I was checking out. We found $8.03, and haven’t done anything with the money. He wants to keep going. I seldom find money, but when I do, it goes in a baby bottle in my clothes armoire and is eventually donated to the local pregnancy center on Jan 22. It’s amzing to me that people won’t bother to pick up a penny. They add up! I don’t do a coin jar or keep track of found change but two events this week were notable. 1) I made $.50 using the coin lockers at the local museum. I think the locker’s coin box was meant to be temporary only, as I found not only my quarter in the locker but someone else’s as well. The other quarter was on the floor. 2) While my roommate was frugally and healthfully biking an errand, he found $10 on the ground. He wouldn’t’ve found it if he had driven. I’m in. I know it is September but why not start now? I know if I am part of a challenge I will be more observant. It’s a great challenge and fun to see how much it adds up to. Welcome!